(January 25, 2012) At its meeting today, the Public Art Commission approved the design concept for the public artwork for the new Steele Creek Division Police Station. The pattern of the tree will create a variety of reflections and shadows. The sculpture will be made out of aluminum and be painted with a white urethane paint and a clear topcoat to create a glossy white surface. However, the light and shadows will produce a range of gray shades across the sculpture. The still unnamed sculpture will be slightly over eight feet tall and weigh approximately 2,400 pounds. It will sit on a three foot high circular concrete base, or plinth. The orientation has not been determined. Mr. Lee plans to visit the site and test the model in different sunlight angles to determine what orientation would create the best light effect. It will require no maintenance but can be washed and waxed periodically as you would a car. It will sit in front of the new police station currently under construction at the corner of S Tryon Street and Westinghouse Boulevard and should be highly visible from passing cars. As one commissioner said, it would be a "significant marker" for the community. The sculpture could become a logo or focal point for the Steele Creek community. The artist's budget for the sculpture is $36,260. Additional costs for the base, mounting, lighting, and other features will come from the overall project budget. Mr. Lee will work with the architects to coordinate the sculpture with the base and other features of the site. 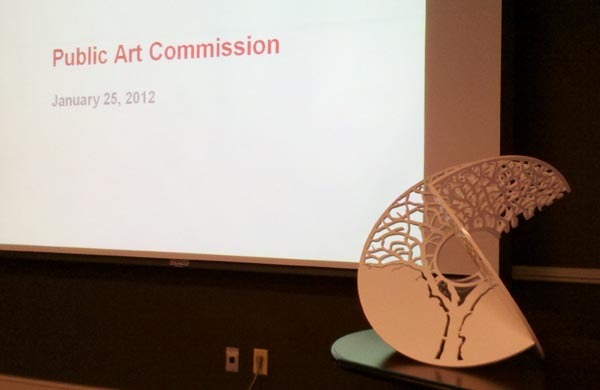 The Public Art Commission must still approve the final design after engineering drawings have been prepared for the sculpture, mount, and base. My concept for the police station is based on the synthesis of two strong fundamental forms in art and design, those of the circle and the tree. The idea of the circle is my response to compliment the contemporary classical post-Modernist architecture of the proposed police station. The building is clean, simple and elegant and I wanted to use the circular form as a way to break up its horizontals and vertical lines, thus activating fundamental principles of design contrasts. The circle is one of the oldest and fundamental forms of design, symbolizing enclosure, coming together, community, encompassing and all embracing, which is apt for the function of the building. It has spiritual and mythological meaning, as well as being a most pleasing form to the eye. The tree is an idea that was mentioned by one of the members of the Historical and Genealogical Society during a meeting of theirs, which I attended. The tree is one of the oldest symbols, representing the center of a community, life, growth, protection, and stability. It has its roots planted firmly in the ground and is thought of as a place for gathering, creating a canopy for protection and shelter. My proposal is that of a contemporary hybrid structure, suggesting advancement into the 21 st century, while simultaneously having its roots planted in history. I consider the circular structure and tree form an ideal hybrid for the concept of both community and law enforcement, which exists to protect and serve.